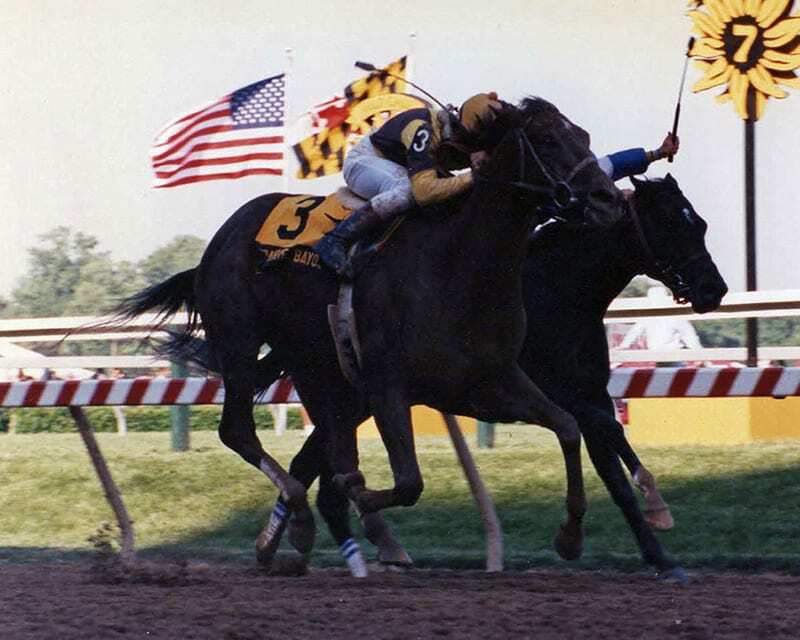 Prairie Bayou ran through the shadows to win the 1993 Preakness. Photo by Lydia Williams. On March 4, 1990, a little red foal was born at Loblolly Stable that would grow up to take the racing world by storm. Owned by the stable that bred him and conditioned by Thomas Bohannan, the foal grew up to be a strong gelding that was named, Prairie Bayou. Nicknamed “Prairie Dog” by those around him, Prairie Bayou displayed glimmers of potential from an early age. After a troubled seventh-place effort in his debut as a two-year-old, the plucky horse found his stride, scoring convincingly in a maiden special weight and an allowance race at Churchill Downs. His season ended with a strong runner-up effort in the Inner Harbor Stakes, at Laurel Park. Prairie Bayou was solid as a two-year-old, but when he turned three the following year, the gelding took off as one of the best of his crop. After a second-place finish in the Pappa Riccio Stakes to start his sophomore campaign, Prairie Bayou set sail on a streak of four straight victories, taking down his rivals in the Count Fleet Stakes, Whirlaway Stakes, Grade 2 Jim Beam Stakes, and Grade 2 Blue Grass Stakes. That run of success made him the betting favorite in the Kentucky Derby, but try as he might, Prairie Bayou could do no better than second on the first Saturday in May, conquered by the another late runner, the Virginia-bred Sea Hero. Prairie Bayou entered the 1993 Preakness Stakes in search of redemption in wake of his defeat in the Kentucky Derby. However, it quickly became clear that, in the public’s eyes, the nimble chestnut had lost little in defeat, because he headed to post at Old Hilltop as the favorite, despite the fact that history was not in his favor. 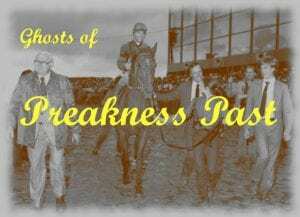 Not since Holiday in 1914, had a gelding won the Preakness Stakes. The starting gates exploded open and the field set sail to the roar of the crowd. Santa Anita Derby winner Personal Hope, soared to the front and got busy setting the pace. Prairie Bayou, who was a dedicated closer, and pilot Mike Smith waited from behind until the moment was right. With the turn for home looming ahead, Prairie Bayou made his move. The red gelding shot forward with scintillating acceleration. He weaved between horses before tipping widest of all for racing room in the stretch. With his sights set on the finish line, Prairie Bayou kicked on for home. He flew home, first over the wire by half a length, successfully fending off the late challenge of Cherokee Run, and giving Hall of Famer Mike Smith his first — and so far only — Preakness win. As the favorite, Prairie Bayou was supposed to win. But when you stop and think about it, the fact that the little gelding ended up in the winner’s circle of the Preakness Stakes is a remarkable feat. “This horse was not one of the lot that would jump out at you,” owner John Ed Antony of Loblolly Stable said. But what the horse did have was heart. Prairie Bayou’s triumph in the Preakness marked the gelding’s seventh trip to the winner’s circle out of eleven lifetime starts and left trainer Tom Bohannan beaming with pride. Prairie Bayou’s scintillating win in the middle jewel of the Triple Crown made him the main attraction when it came time for the final leg of the Triple Crown, the Belmont Stakes. The steadfast runner was expected to rise to glory once again, but it was not meant to be. As Prairie Bayou raced down the track, behind the rest of his foes, he took a bad step, unseated his rider, and continued trying to run on. He suffered a series of injuries, among them a compound fracture to his cannon bone, and was humanely euthanized. Prairie Bayou left the world far too soon in 1993, but his heroic efforts on the track were not forgotten. At the end of the year, he was posthumously honored with the Eclipse Award as the Champion Three-Year-Old Male.